Do you ever feel the monotony of working day after day just to be able to work again tomorrow? Perhaps you have an interest in the mystic arts or the occult? Do you want to be part of something bigger than yourself? Then maybe it is time to join a cult! If that is too much work, then maybe just play Cultist Simulator. 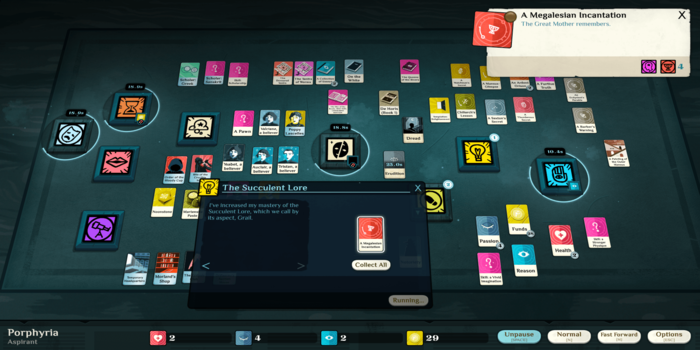 Cultist Simulator is a cross between a tabletop card game and a text-based RPG. There are some main categories such as Work, Dream, Explore, Talk, and others that you bring specific cards to in order to start timed events. When the events end, cards might be altered and/or you may get specific or random cards. The cards are varied from things like Health, Vitality, Reason, and other ideas to specific locations and characters. You have to use specific cards in specific categories in order to advance toward being in a cult while also keeping enough health and funds to stay alive. You can also pause or speed up the game to help get through events faster and easier. When (not if) you die, you can start a character with a different background that gives you new advantages or perspectives such as starting with a better job in order to get funds more easily. If this sounds confusing… well, that’s because it is. There are tons of cards that all do different things, start different events, and can even alter events by being added to them after they start. A large portion of the game is organizing the cards and categories on the table as you keep getting more. Some cards even disappear or change into something else after a certain amount of time without being used. Some categories show up suddenly and kill you or cause some other harm if you don’t put specific cards on them in a certain amount of time. This makes it very easy to get overwhelmed and lead it to spiral if you don’t make good use of the pause function. In 10,000 words or more. The explanations that appear for the cards and events are often wordy and vague which doesn’t really help you figure out what you need to do next. This also forces you to keep pausing the game to read which either makes you tired of reading or breaks any kind of tension with the other timed events going on at the same time. Cultist Simulator often plays like a book. That being said, the art that is in this game looks great. 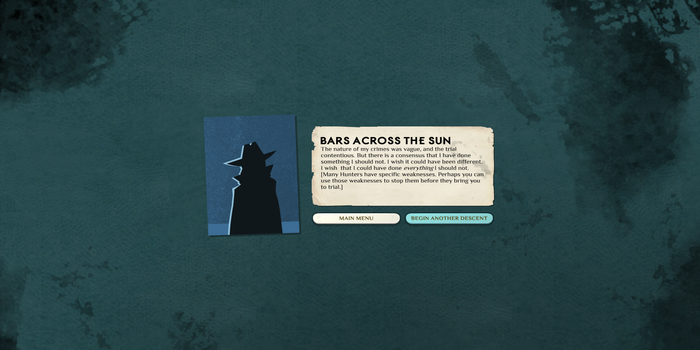 The music does cause a suspenseful atmosphere that helps bring a tense feeling as your character is “going down the rabbit hole.” When things are going your way, Cultist Simulator is a fun text-based mystery which is rare these days. However, the tendency to be over-complicated and the sudden downward spirals on characters really overshadow some of the potential that the game has. A Steam code was provided by Weather Factory Weather Factory for review.